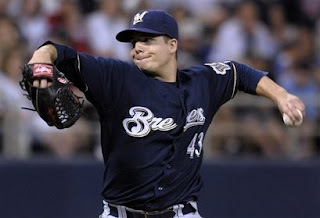 Parra Leads Brewers to Another Victory ~ The Bucky Channel - The World of Sports from Wisconsin's Perspective. I wouldn't have believed it if I didn't see it with my own eyes, but the Brewers somehow scored 5 runs without the benefit of the long ball. Aided by RBI's from Braun, Hart, Kendall, and even two from Bill Hall, the Brewers were able to take game two from the Twins 5-1. The Brewers are also sort of following a trend lately in their victories. They score the runs early, and then leave it up to the pitching staff to take care of the rest. Manny Parra answered the call, with another brilliant game. I was down on Manny earlier in the year, I've always thought he's been the benefactor of too much hype. I keep hearing people (specifically, Bill Schroeder of FSN Wisconsin) tell me how great Parra is going to be, and how he has future ace potential. I heard the same thing for years about Ben Hendrickson, so you can understand my hesitation. Yet, Parra has been hitting his stride as of late, and went seven innings, giving up just two hits. The rubber match is going on as we type, so we're going to get back to that now. Gagne Returns... But to Where? How About Some Soccer News? Could ESPN Be Any More Obvious? Alright. I'm With You. It's Time to Fire Yost. Where Does Your Manager Rank? Slow News Day Make-Up Video! Who's Ready For Euro '08?